YOUNGSTOWN, Ohio - Owen Gallatin (Hugo, Minn.) scored in the U.S. National Under-17 Team’s 4-1 loss in its last regular-season game at Covelli Centre against the Youngstown Phantoms on Saturday, Apr. 13. The U.S. National Under-17 Team’s record is 18-28-3-5, while Team USA’s combined record in USHL play is 30-24-2-6. The Phantoms’ record is now 36-21-1-4 (W-L-OTL-SOL). Team USA struck first at 9:38 in the opening frame. Gallatin received a pass from Hunter McKown (San Jose, Calif.) across the offensive zone, and tucked it away to give the U17s a one-goal advantage. Despite two power plays, the U17s could not extend its lead and went into the middle frame with a single-goal lead. At 4:21 into the second period, Youngstown tied the game up with a power-play goal. The goal was scored by Cassaro with an assist from MacEachern. Gaining the go-ahead goal with 7:43 left in the middle frame, DeMelis registered an unassisted goal and Youngstown’s second goal of the game. 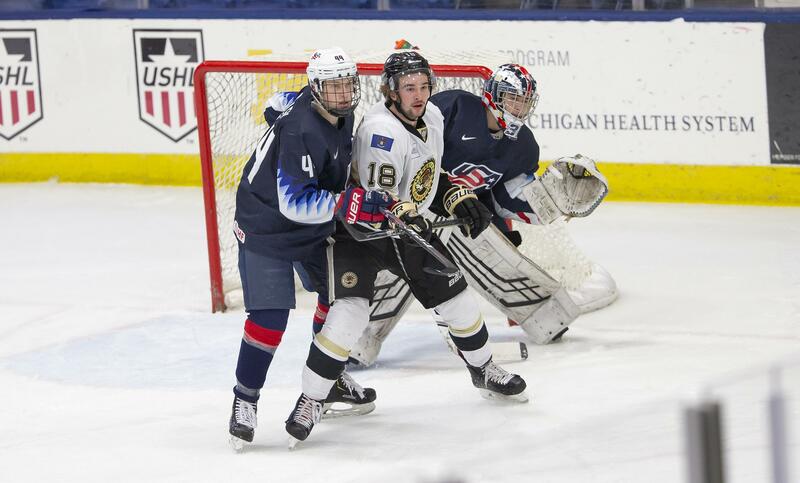 Outshooting Youngstown 12-11, Team USA was unable to net a tieing goal. Murray scored a Youngstown goal late into the second with 2:05 left on the clock. MacEachern earned his second assist of the game. Ending the game at 4-1 with 10:10 left in the closing frame, Youngstown’s MacEachern scored, assist tallied to Murray and Malone. Drew Commesso (Norwell, Mass.) played all sixty minutes, saving 23-27 shots on net. NOTES: Team USA outshot Youngstown 26-27 … Team USA went 0-for-6 on the power play and 4-for-5 on the penalty kill.